HORSE JUDGING COURSE OFFERINGS COMPARISON– Please be sure to review this page to be sure you are registering for the correct course(s). Central Carolina Western Horsemen’s Assoc. Cape Fear Trail Riders Assoc. Plantation Pleasure Walking Horse Assoc. of N.C.
Over 3,800 judges have participated in the clinic since 1986. Announcing the 35th Annual North Carolina Open Horse Show Judges’ Certification Clinic on North Carolina State University’s Main Campus in Raleigh, NC. 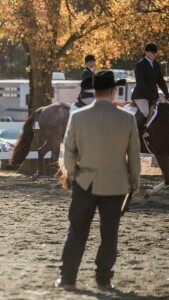 This clinic is designed to provide individuals who are, or aspire to be, horse show judges with practical “hands on” experience in judging saddle seat, hunt seat, non trotting and western classes. Participating judges will have an opportunity to judge 20-27 conformation and performance classes, complete a required 20-25 question exam in each of the four divisions, and receive certification in these four divisions. A panel of breed recognized professional judges from across the nation will discuss the class placings and present lectures on judging procedures. Individuals completing the clinic will be included on a list of suggested horse show judges that will be annually revised and distributed to open horse show organizations located in North Carolina and surrounding states. Judges receiving an average score of 90% or higher per show division will be certified for that respective division. A minimum of 33% of participating judges will be certified in each division. Certification will be awarded separately for each division. A judging list will be forwarded upon request to breed associations for applicant judges and horse show organizations throughout the United States. Participation in the NCSU Horse Judging Short Course is highly recommended but not required for individuals new to the judging experience. Advanced registration with $125.00 clinic fee is to be postmarked by October 31, 2018 for participating judges (19 years and older). This fee includes all instruction, certification examinations, and inclusion on the 2018 NC Open Horse Judges’ Certification List, as desired. A $25 late fee will be assessed to judging participants registering after the deadline date. Judges’ refunds will be honored if received in writing post-marked prior to October 31, 2018. A separate check must be provided for each participant. OHSJC 2019 Registration Form- Coming Soon! 30 rooms have been blocked at the Holiday Inn and Suites Cary. To make a reservation, please call 919-851-1220 and request the Open Horse Show Certification rate of $81.00 per night.